Charles Garner was born in Holbeach, Lincolnshire in 1880 2, one of eight children of John (b. c1845, Sutton Bridge, Lincolnshire) and Martha Ann (b. c1847, Holbeach, Lincolnshire née Goodge). In 1901 the family, including Charles and a younger brother, was living at Newark, Notts where John worked as a maltster. Charles was working then as an engine driver3. By 1911, the family had moved to 5 Myrtle Grove, Beeston, Notts, where both John and Charles were working at a nursery garden - probably the nearby Frettingham's nursery garden4. On 3rd November 1912, Charles married Louisa Garner at Beeston Parish Church. Louisa, notwithstanding her surname, had no obvious family connection with Charles. Born in Shefford, Bedfordshire in about 1881, she had been working in the Beeston area as a domestic servant. It appears that several children were born to the couple5. As Charles' Army Service Record has not survived, we do not have a precise record of when he enlisted with the Lincolnshire Regiment, but it likely to have been sometime early in 1915, becoming part of 6th (Service) Battalion which had been formed at Lincoln in August 1914, coming under the command of 33rd Brigade in 11th (Northern) Division6. In July 1915 the regiment had moved to Gallipoli and had taken part in the disastrous landing at Suvla Bay in August by the time Charles had completed his training and joined the regiment in Gallipoli on 1 December 1915. Later that month, badly hit by combat losses, disease and severe weather, the regiment was moved to Alexandria to take over the defences of the Suez Canal. On 2 July 1916, the regiment was moved to the Western Front, landing at Marseilles on the 8th July. Two months later, the regiment would be assigned to the fierce fighting of the Somme Battle, which had been launched on July 2nd, but initially, on July 20, it took up a section of the line, astride the Arras-Bapaume Road7. This was important supply route for the Somme offensive which was raging, 20km to the south. At this stage, the regiment faced only occasional bombardments by trench mortars and casualties were light. Nevertheless, it was at this time, on 2nd August that Private Garner was killed. Private Garner was buried in the Faubourg d'Amiens Cemetery. 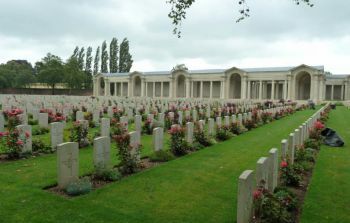 This cemetery, in the Pas de Calais region of France, contains 2,650 Commonwealth burials of the First World War, 10 of which are unidentified. He was posthumously awarded the 1915 Star, the Victory Medal and the British Medal. His widow, Louisa Garner, lived with her children at 13 Villa Street, Beeston until the 1950s after which she may have left to live her last days with her family8. Her husband's Army financial effects of £2 7 8d were paid to her on 1 January 1917 and she received his War Gratuity of £6 10s on 13 September 19199. 4Beeston, Notts, 1911 Census, Piece 20430 RD429 SD3 ED5 Schedule 245. Frettingham's Nursery Gardens were on Moore Gate, Beeston. Also present were two of Charles' siblings, Thomas (b. c1886) and Richard (b. c1894). 5Charles Garner, born 3 November 1914, was certainly their son. When he joined Beeston Boys' Brigade in November 1927, he stated that he had a brother and two sisters at home. 8She appears consistently at the Villa Street address in local records between 1921 (Electoral Roll) and 1952 (when she is listed in a Street Directory). As her death does not appear to have been recorded locally, it appears likely that she went to live with a son or daughter's family, outside the district, prior to her death. 9Army Registers of Soldiers' Effects, 1901-1929 (ancestry.com). The amount of the gratuity tends to indicate that he enlisted in February 1915.